A small beer breakup could give cold comfort to a big beer merger. Suntory Beverage & Food may end its three-year-old joint venture with China’s Tsingtao Brewery to sell suds in the People’s Republic. Since teaming up in 2012, industry-wide production volumes have started to shrink. That harsh reality could shake up the world’s biggest market as Anheuser-Busch InBev and SABMiller unite. Japan’s Suntory is aggressive when it comes to overseas expansion. In recent years, the beverage group has devoured U.S. distiller Jim Beam and the British soft drinks brands Ribena and Lucozade. The company generated revenue of 535 billion yen ($4.5 billion) outside its home market last year, accounting for 43 percent of the top line. That suggests something is definitely wrong if Suntory is turning bearish on a market where per capita consumption of suds remains little over half the level in the United States. 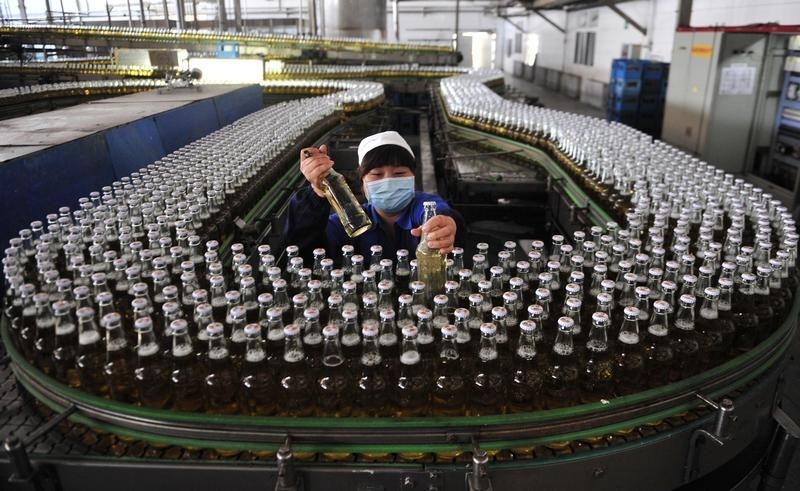 China accounts for a quarter of the beer brewed in the world and a tenth of its sales, but only 3 percent of the global profit pool, according to Deutsche Bank. Production shrank last year after having grown steadily every year since 2004. The trend is continuing, too. Brewing fell 6.2 percent during the first half of the year, compared to the same period a year earlier, according to China’s National Bureau of Statistics. A slowing economy and a shift by consumers to other tipples like wine are likely to keep weighing on the market. Tsingtao has been hit particularly hard. Shares in China’s cash-rich number two brewer by volume have fallen 19 percent this year, against a 3 percent rise in the Shanghai Composite Index. Daiwa reckons Tsingtao is losing market share to AB InBev and its Budweiser brand at the high end and to state-backed Beijing Yanjing Brewery in the mass market. Consolidation might help, though. Although the top five brewers in China are responsible for about 70 percent of volume, the market remains one of the most competitive in the world. Local regulators probably will force AB InBev and SABMiller, which owns nearly half of CR Snow, the country’s largest brewer, to make divestments as part of their mega-merger. That might help spur an overdue round of Chinese beer M&A. Suntory’s decision to pull back suggests that it can’t happen fast enough. Japanese conglomerate Suntory Beverage & Food may unwind its loss-making joint venture with China’s Tsingtao Brewery, Reuters reported on Oct. 16, citing unnamed people familiar with the matter. A Suntory spokeswoman separately confirmed the company was discussing “various possibilities” with Tsingtao but could not comment further. The Nikkei financial daily reported earlier that Suntory would sell its stake in sales and production ventures to Tsingtao for about 10 billion yen to 20 billion yen ($84.07 million to $168.14 million), in the first half of 2016. The units make and market both Suntory and Tsingtao beer in Shanghai and part of Jiangsu Province, the newspaper reported. It added that Tsingtao, the second biggest brewer in China, would continue to produce Suntory beer. Suntory set up the joint venture in 2012, but it has faced stiff competition from industry leader CR Snow.